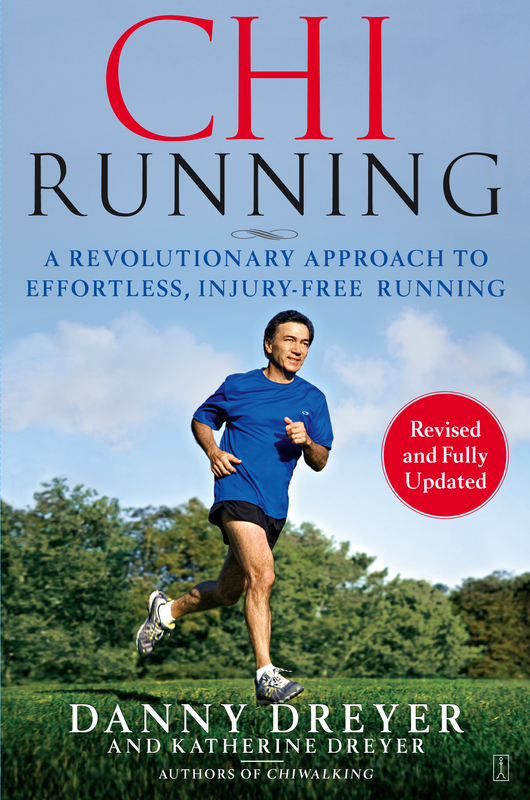 The revised edition of the bestselling ChiRunning, a groundbreaking program from ultra-marathoner and nationally-known coach Danny Dreyer, that teaches you how to run faster and farther with less effort, and to prevent and heal injuries for runners of any age or fitness level. In ChiRunning, Danny and Katherine Dreyer, well-known walking and running coaches, provide powerful insight that transforms running from a high-injury sport to a body-friendly, injury-free fitness phenomenon. ChiRunning employs the deep power reserves in the core muscles, an approach found in disciplines such as yoga, Pilates, and T’ai Chi. 1. Get aligned. Develop great posture and reduce your potential for injury while running, and make knee pain and shin splints a thing of the past. 2. Engage your core. Shift the workload from your leg muscles to your core muscles, for efficiency and speed. 3. Add relaxation to your running. Learn to focus your mind and relax your body to increase speed and distance. 4. Make it a Mindful Practice. Maintain high performance and make running a mindful, enjoyable life-long practice. 5. It’s easy to learn. Transform your running with the ten-step ChiRunning training program. So why don't adults run like kids, with that same ease and joyfulness? After running for thirty years and working with thousands of runners, I'd have to say that the two biggest factors are stress and tension. I can speak for myself, and maybe you can relate. Since I left the sixth grade, I have put my body through a wide range of physical and emotional stresses, such as tightening my shoulders when I'm worried, slouching all day at my desk, holding tension in my neck while driving -- the list is endless. Individually, these might not sound like a big deal, but when you add them all up over a lifetime, they have a major cumulative effect on how you move. I've also done a few radical things that have taken a bit more of a toll on my body, like skiing off cliffs and doing face plants while skateboarding. As Carolyn Myss, author of Anatomy of the Spirit, would say, "Your biography becomes your biology." With all of this abuse stored in my body, I'd be hard-pressed to run like I did as a kid. The good news is that for anyone with a little patience and perseverance, it is possible to get back to that state. There are over 24 million runners in the United States alone. But get this. It is estimated that 65% of all runners incur at least one injury a year that interrupts their training. That means that 15.6 million people will get injured this year from running. No wonder people have a love/hate relationship with running. It's one of the most accessible and inexpensive ways to stay in shape, yet it poses a danger that is cautioned in articles, books, and doctors' offices everywhere. Most people treat injury as part of the sport and learn to accept that it will happen sooner or later: "I'll deal with it when it happens." It's the same line I get when I ask people in the San Francisco Bay area if they worry about earthquakes. The conclusion I've come to after teaching countless runners is that running does not hurt your body. Let me repeat that -- and you can read my lips -- running does not hurt your body. It's the way you run that does the damage and causes pain. When Adriane, 42, came to me, she was caught in a back-and-forth cycle of training hard to get into good condition, then getting injured and having to lay off for a couple of weeks, then starting all over again. She thought it was the right thing to constantly train fast and strength-train to improve her times in the marathon. But she was not making any forward progress because of the nagging injuries and her own internal pressure to keep increasing her weekly race-training schedule. With the ChiRunning technique, she learned how to relax while running and, more important, in the other areas of her life. She realized that she was not only a driven runner, she was a driven person. Without all the tension in her body, she stopped injuring herself while running, and her training took on a new level of consistency. surgery. He was afraid that if he continued running, he would ruin his knees and live in pain for the rest of his life. It has now been two years since his first class, and he is running regularly -- including an hour and a half on steep trails once a week -- and looking forward to many more years of pleasurable running. In fact, he wrote to me recently, thrilled that he had finished first in his age group in a local race, something he had never dreamed of even before his surgery. Carmen, 35, was a beginning runner and insecure about her ability to do anything well physically. After taking a series of three ChiRunning classes, she happened to call as my wife, Katherine, and I were reviewing her class on video. Katherine remarked on how good Carmen looked in the film and asked her how she liked the class. "Oh, it simply changed my life" was the reply. "For the first time in my life, I feel like I can be good at a sport." From beginners to competitors to the forty-plus crowd who are afraid of injuring themselves as they get older, ChiRunning is meeting the needs of runners with an approach that builds a healthy body instead of breaking it down from misuse or overuse. The current paradigm of running form and injury prevention is founded in muscle strength. It is basically built around three principles: (1) If you want to run faster, you need to build stronger leg muscles. (2) If you want to run longer, you need to build stronger leg muscles. (3) If you want to avoid or recover from injuries, you need to build stronger leg muscles. Do you see a theme developing here? It's all dependent on muscles to get the job done, and the leg muscles are given the bulk of the responsibility to make it all happen. That's a lot of responsibility and, according to T'ai Chi principles, a very unbalanced way to move your body. The problem with strength training is that it doesn't get to the root of the most common cause of injury: poor running form. Most runners want to run either longer or faster at some point in their running career, but without good running form, added distance will only lengthen the time you are running improperly and increase your odds of getting hurt. If you try to add speed with improper running form, you are magnifying the poor biomechanical habits that could cause injury. So, the best place to build a good foundation is in getting your running motion smooth, relaxed, and efficient. Then you can add distance or speed without risking injury. This book presents an alternative to what we call power running. ChiRunning is based on the centuries-old principle from T'ai Chi that states, Less is more. Getting back to that childhood way of running doesn't come from building bigger muscles, it comes from relaxing muscles, opening tight joints, and using gravity to do the work instead of pushing and forcing your body to move in ways that can do it harm. Most runners, especially those over 35, will tell you that running can keep you in good shape but it's hard on your body. I developed ChiRunning because I really didn't believe that pounding and injury should be a part of running. I just didn't buy it. I've never considered myself a great runner. I liked to run as a kid, but I shied away from it in high school because, to tell you the truth, I was intimidated by the caliber of our track-team members, most of whom could run a hundred-yard dash in under 10 seconds and a quarter mile in under a minute. In an inner-city high school with 3,600 students, the coaches could basically pick from the cream of the crop, and I hardly considered myself even potential cream. So I joined the ski club and partied instead. In fact, I signed up to take gymnastics, because every Wednesday the gym classes had to run around a nearby lake, and I couldn't imagine making myself run for twelve minutes without stopping. Don't get me wrong. I've always loved sports, and I love to learn new things with my body. Whenever I wanted to take on a new sport, I would apply another love of mine -- figuring out how things work. As far back as I can remember, I've always had questions running through my mind, like: "Why does a clock tick?" or "What kind of machine wraps a stick of butter?" As a kid, I loved taking things apart to see what made them do what they did, then I'd try to put them back together again. Although I had a lifetime average of about 75% on the reassembly, I always figured out how they worked. This is what I did with skiing, rock climbing, and sailing. I broke each sport down into its elemental parts, which would then give me a physical understanding of how to put it all together into a unified movement. As I found myself improving, I would get more excited and consequentially focus even more. My learning was driven by my passion, so my hours spent practicing would fly by. I loved learning new body skills. In my early twenties, when I took up running, I approached it in much the same way. I began running regularly in 1971, when I got drafted into the army. Running around the army base at an easy pace was very relaxing for my body and helped to settle my mind. This was the first time I had used a sport for more than physical fitness: I wasn't into being in the army, so I used running to escape the barracks and explore. After doing an eighteen-week stint with Uncle Sam, I was graciously given an honorable discharge, but not before discovering a new favorite pastime. When I was a young adult, my curiosity about how things worked extended into those unseen forces out of which the physical world springs forth. I was no longer satisfied with only understanding the how, I wanted to know why they worked. I always came away with a sense that there was more going on than I was seeing. For lack of a better term, I call it the invisible world, and my curiosity about it is still the driving force behind my approach to life. It eventually led me to the study of T'ai Chi and using chi in my running. The same year I started running, I began my investigation of the invisible by practicing long hours of meditation with a teacher from India. The most important knowledge I gained was how to quiet my mind so I could listen to my body. As my meditation practice began to spill into my running, my running became more and more an exploration of my own physical nature and the energies powering it. Fast-forward to 1991. Over a period of twenty years, my running and my exploration of the invisible had become increasingly intertwined. I began running longer and longer distances as a means of exploring the potential of my body, which is what led me to the sport of ultramarathon running (distances longer than 26.2 miles). In 1995 I ran my first race, a fifty-miler in Boulder, Colorado. Since then I have completed thirty-four ultramarathons, winning my age group in fourteen of them and placing in the top three in my age group in all but one. The distances I have raced are 50K (31 miles), 50 miles, 100K (62 miles), and 100 miles. In 2002 I ran my first marathon (the Big Sur International Marathon), winning my age group in a time of 3:04, which I was very pleased with, considering there's about a thousand feet of vertical gain on the course. Now, I just have to say right here, the ChiRunning technique is not about running super-long distances. I have chosen ultradistance running as a way to learn about my body, but I don't necessarily recommend it for everyone. If you are so inclined, ChiRunning certainly makes distance running more enjoyable, but even more important, it represents a way to move your body by using mental focus and relaxation instead of muscle power. In this book you will learn about the principle of "Form, Distance, and Speed," which means that you start by building a foundation of correct running form. As your foundation gets stronger, your body will be able to handle more distance. Then speed becomes a by-product of good technique practiced over increased distance, not something dependent on the size and strength of your muscles. Ultimately, you're not working to build distance and speed, you're working to build presence, and that can happen at any distance or speed. When I first started running ultras, they were hard work. Along the way I had bouts with aches and pains, which I tried to approach with a positive attitude, telling myself, "If you can get this right, you might not have this pain again." At one point in my training, I had a knee pain that would start about twenty miles into my long run. But I never blamed the running for injuring my body. Instead, I took full responsibility by always trying to figure out how my form was causing my knees to hurt. I assumed that it was a matter of making the right correction, and I let that premise guide me in my trial-and-error research. In 1997 my eyes were opened to a whole new realm when I met Zhu Xilin, a T'ai Chi master from China who introduced me to the concept of moving from one's center and letting the arms and legs follow. His way of moving his body looked both effortless and powerful. Needless to say, adapting this idea to my running was a huge draw for me. T'ai Chi owes its origins to the study of animal movements. According to the Chinese, chi (pronounced chee) is the energy force that animates all things. It runs through a system of meridians that distribute this energy to all parts of your body. By practicing mental focus and relaxation, one can learn to sense and direct this subtle energy through the system of movements and exercises known as T'ai Chi. This concept is downplayed by Western medicine because chi cannot be detected with measuring instruments and cannot be supported by the scientific method. The interesting part about chi is that it will move through your body whether you believe in it or not, because if it weren't running through you, you'd be dead. Fair enough? The current trend in sports training toward using one's core muscles is just starting to scratch the surface of knowledge the Chinese have been developing for three thousand years. One of the things T'ai Chi teaches us is to direct movement from points along our spine; thus it can originate from the center line of your body and not from the peripheral. Observation of Nature teaches us that the strength of a tree lies in its trunk, not in the branches and leaves. Why should the human body be any different? Why do you think the area of your body that houses all your vital organs is called your trunk? Are we nodding yet? Look at the movement of a cheetah, the fastest land animal on earth. It doesn't have big strong legs like a tiger. It has skinny legs like a greyhound. So how does it go so fast? The secret lies in its spine, which is where most of its chi energy is contained. When a cheetah runs, you can see that its source of power comes from the spine and not the legs. For your legs to be powered by the chi energy coming through the spine, they need to be very relaxed. Master Zhu would constantly tell me to keep my spine straight but relax the rest of my body and let the chi flow through "like water through a pipe." A major lightbulb went off in my head when it occurred to me that this idea could be applied to running. I started to grasp the idea of moving my body from its center and letting my legs be pulled along for the ride. But relaxing my arms and legs while running only uncovered the next problem in the chain -- the need to relax my shoulders and hips. Once I became adept at relaxing, I could feel how much power my spine had when it wasn't met with any resistance from the rest of my body. That was when I began to experience a new level of smoothness and ease, often feeling as if I were skimming along on a conveyor belt. As I worked on technique, my sense of running more smoothly and efficiently gradually began to replace that old feeling of working hard to run. My breathing became less labored, my muscles were not getting sore, and many times I would feel better at the end of a run than I did when I started. I could go out for a thirty-mile run and come back without any major discomfort: an exhilarating realization. "Postrun recovery" began to take on a whole new meaning -- hours instead of days, and sometimes no time at all. This is when I realized that I was onto something very cool. Since my discovery in 1998, I have not had a running injury of any kind (knock on wood), despite a heavy teaching, training, and racing schedule. In 1999 I moved from Boulder to San Francisco, feeling a great sense of loss at having to leave Master Zhu. When I first arrived, I ran through Golden Gate Park, looking for a new T'ai Chi teacher. Each day I'd see many small groups practicing their moves, and there would be Master Xu, who always had only one student. He would be manually moving his subject into various postures, like an artist shaping a clay figure. He was totally attentive to his students in a way that I never witnessed in any of the other teachers. After seeing him numerous times at the same spot, I decided to ask him if he would be my teacher. I introduced myself and said, "I don't care if I ever learn T'ai Chi, but I want to learn how to apply what you do to my running." His face lit up. "I've always had a theory," he said, "that one could take all the principles of T'ai Chi and use them in any sport. Come back in three months." That was it. He never gave me his name or phone number. Just "Come back in three months." What could I say? So, after ninety days of waiting, I went back and found him in the same spot where I left him. I reminded him who I was, to which he responded, "Okay, start tomorrow." I fully expected him to end his sentence with "grasshopper." As it turns out, George Xu is an internationally known T'ai Chi master who leads seminars all over the world and has produced an extensive collection of videotapes documenting many Chinese masters of almost every martial art in China. Since that day, Master Xu (pronounced "shoe") has had a huge impact on the further development of what I have come to call ChiRunning. He has not only confirmed and clarified all that I'd discovered prior to meeting him, he has helped me to synthesize the themes of T'ai Chi with what I've learned about running. I've always loved to watch people run. It's wonderful to see how many different types of bodies there are and how many different ways they run. But if you want to see what's really going on with a runner, watch her face. If you watch children run, they're generally all smiles. But what I see more often than not in adults is an expression that ranges somewhere between discomfort and terror. Lots of folks leave me with the impression that they're not enjoying themselves. No wonder running has a bad rap. What happened to all those smiles? We need to reeducate ourselves to move in the ways we were designed to move. Most people are never taught how to run. It's one of those things we all take for granted because everyone runs soon after learning to walk. Go to any fitness center or gym or continuing-education catalog, and you'll find classes in every sport on the planet except running. This was a big part of what convinced me to become a full-time coach and running instructor. As I brought more of the inner focuses of T'ai Chi into my running classes, the students began to see immediate and dramatic changes in their performance and outlook. Since introducing the ChiRunning technique to the general public, I've seen many of those smiles reappear. Through my T'ai Chi teachers, I have learned that losing the beautiful ease of movement we had as children is part of the process of maturing as a human being. Children move naturally but not consciously. It is our job, as adults, to learn how to consciously move through life with that same flow and beauty. It is through conscious action and understanding that we can become masters of our bodies and ourselves. The ChiRunning technique is the vehicle that will allow you to experience once again what it's like to run with a sense of power and connection in your body. I still don't consider myself an exceptional runner. When I run, I rely almost entirely on inner focuses and technique rather than on talent or physical strength. Ultimately, ChiRunning is not about being an accomplished runner, it's about what you come away with. It's learning how to listen to your body and adjust appropriately to improve your form and enhance your performance. It's learning how to sense your body, your actions, and the results of your actions; how to learn from what you do and what you feel. It's learning how to use running as a vehicle to discover yourself on many levels. If you would like to improve your running form, have fewer injuries, develop your own training program, and be able to run into your old age, then this book is for you. If you would like to increase your overall health and well-being, this book is for you, too. If you would like to learn to be more centered and have more of a mindful approach to your running and your life, this book is also for you. ChiRunning is not so much about the running as it is about the chi. It's about having a focused and energetic relationship with your body. It means learning how to be your own best friend, teacher and guide -- how to be mindful, quiet, and energetic all at the same time. Sound great? It is. I'd like to take a minute here and clue you in on what to expect in the coming chapters. As a fair warning, I do not get into explaining the technique of ChiRunning until Chapter 4. So if it feels like I'm taking forever to get to the good stuff, there's a reason. This book tells you not only how to be a better runner, it also offers you the opportunity to develop qualities from running that you can use in the rest of your life. This approach to running is best understood when you can see the background and logic supporting it. The first three chapters are dedicated to laying out the philosophical foundation, so when I give you the specifics of the technique, they will all make sense. Chapter 1 compares the present paradigm of running, power running, to ChiRunning, the proverbial new kid on the block. Chapter 2 introduces you to the five Principles, or natural laws, upon which T'ai Chi and ChiRunning are based. When your movements are in sync with the laws of Nature, you have one of the best support systems around, to put it mildly. Chapter 3 will explain to you the "inner" skills of ChiRunning, which I call Chi-Skills. Learning these four mind/body skills will change your running into an entirely new activity. Chapter 4 introduces you to the ChiRunning focuses, which are the specific physical and mental methods used to run more smoothly, efficiently, and injury-free. Chapters 5 through 9 teach you how to bring the ChiRunning technique into your running program including program development, peak performance training, and diet. Chapter 10 then tells you how to bring the ChiRunning principles into your everyday life. I would suggest reading the book straight through once. Then go back and reread portions that you didn't feel clear on. My favorite trick with a manual is to mark all of my favorite sections with a tab, labeled for easy reference. If you want something more permanent and reliable, go to your local office-supply store, buy some stick-on plastic tabs, and go crazy. I'd mark all the exercises, drills, focuses, and tips so you can access the information easily if you're on your way out the door for a run. Believe me, you will use this book more often if you have a system in which the information is at your fingertips. I've found that the body and mind learn best through repetition. For this reason, I recommend that you reread this book several times, then at least once a year, to keep your mind and body refreshed with the process and terminology. Take your time, and you'll learn more, faster. Learning the basic ChiRunning technique can take anywhere from one to three months for the average runner, but the greater knowledge gained from the approach will be something that, when practiced regularly, will influence your thoughts and actions for the rest of your life. Danny Dreyer, an esteemed walking and running coach, is a nationally ranked ultramarathon runner. He conducts workshops nationwide and lectures frequently at races and events. He is the coauthor, with Katherine Dreyer, of ChiRunning. Katherine Dreyer has more than thirty years of experience in the health, personal growth, and fitness fields. She partners with Danny to coordinate the international ChiRunning, ChiWalking, and ChiLiving programs.